NYC, 02/16/2019, 2:00PM. 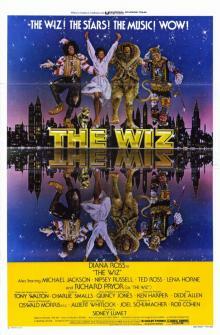 The Wiz (1978): Four time Oscar nominated fantasy starring Michael Jackson. An adaptation of "The Wizard of Oz" that tries to capture the essence of the African-American experience. 134 min. Director: Sidney Lumet. Starring Michael Jackson, Diana Ross, Nipsey Russell. The Wiz features Michael Jackson in his first starring theatrical film role. Jackson later starred in films such as Disney's Captain EO in 1986, the anthology film Moonwalker in 1988 and the posthumous documentary This Is It in 2009.